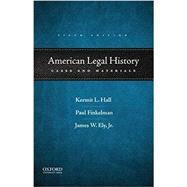 by Hall, Kermit L.; Finkelman, Paul; Ely, James W.
This highly acclaimed text provides a comprehensive selection of the most important documents in American legal history, integrating the history of public and private law from America's colonial origins to the present. Devoting special attention to the interaction of social and legal change, American Legal History: Cases and Materials, Fifth Edition, shows how legal ideas developed in tandem with specific historical events and reveals a rich legal culture unique to America. The book also deals with state and federal courts and looks at the relationship between the development of American society, politics, and economy and how it relates to the evolution of American law. Introductions and instructive headnotes accompany each document, tying legal developments to broader historical themes and providing a social and political context essential to an understanding of the history of law in America. Setting the legal challenges of the twenty-first century in a broad context, American Legal History, Fifth Edition, is an indispensable text for students and teachers of constitutional and legal history, the judicial process, and the effects of society on law. Paul Finkelman is the John E. Murray Visiting Professor of Law at the University of Pittsburgh School of Law. Florida Stand Your Ground Law (2005). Voter I.D. Laws: Frank v. Walker (2014).